One of my herb garden favorites- sage. There are many great uses for this herb, including, but certainly not limited to, holiday stuffing. Thyme is another favorite easy to grow herb. I'm not sure who loves it more, me or the bees! I enjoy it in sauteed vegetables, salad dressings, and more. I'd love it if you would share your favorite uses for these two herbs! I love sage and like many the only way I used it was dressing, now that I've grown it myself I use it as a rub mixed with thyme, rosemary, basil add a little fresh garlic and um good pork loins, meatloaf, even a great topping on French bread dough just before the oven. Have a wonderful day. 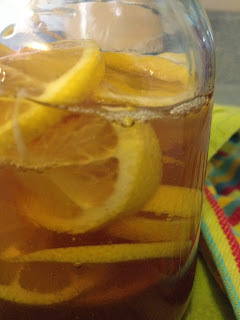 I am so excited to make herbal honeys this summer... this inspired me even more! This year I will finally have enough herbs to do all the recipes I want to make. I will be sharing on my blog about it sometime this summer. Herbal honeys are simple to make and so delicious. I look forward to reading about how your herbal honey turns out, as well. I like to use sage as some of the dried materials in my fall wreath creations. The wonderful fragrance helps to keep the house smelling like the garden even when everything is closed up for the winter months. That is a great idea! Thanks for giving me a way to put my over zealous sage plant to good use this fall.